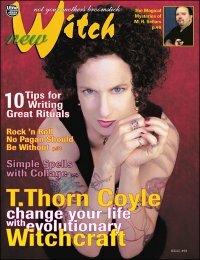 newWitch #08 Witchcraft for Winter (download) [nw008e] - $5.95 : BBI Media - Magazines that feed your soul. T. Thorn Coye: A Rose of Feri. Priestess and author T. Thorn Coyle proves that breaking boundaries can help transform the world (and ourselves). Interview by John Sulak. Have Yourself a Merry Little Yuletide. Tips for turning the winter holidays back into holy days. By Sally McSweeney. Santa Lucia: the Return of the Light. How to make this saint's feast a Pagan festival. My Diane Saarinen. Glamouring: the Magical Art of Serendipity. Finding magic in city streets as well as moonlit glades. By Elizabeth Vong. Corpses, Candles, and Cauldrons. An interview by Michael Samhain with magical mystery writer M. R. Sellars. Give Me That Old-Time Religion. Discover the hottest new trend in modern Paganism -- discovering our ancestor's religions through Pagan reconstructionism in this beginner's guide by Caroline Tully. Evocation 101. Calling the gods means more than picking up the phone. Find out how to make your evocations more effective in this article by Laura Britton. The Magic of Anime. Author and magician Taylor Ellwood introduces the magic of Japanese animation. Cut and Paste. Simple spellwork with collage, by Taylor Ellwood. Plus: City Witch (by Christopher Penczak), Jason Pitzl-Waters (of the Wild Hunt) interviews Incus frontman Jason Cohen, The Hedonist's Wheel of the Year, Transiting Venus (Planet of Magical Attraction), Dream Time Magic, short fiction by Ceallaigh McCath-Moran, poetry, and Good Witch/Bad Witch.